Look, $550 is a lot of money... unless you’re talking computers. Any computer you buy for that little is firmly a “budget” PC, as far as the people making them are concerned. They’re not impressive, or especially fast, or pretty. They’re purely functional—the Ford Fiesta of computers. The sheer mediocrity of the sub-$550 range of laptops is why the new $550 Microsoft Surface Go is so damn special. It’s a cheap laptop that’s actually nice. 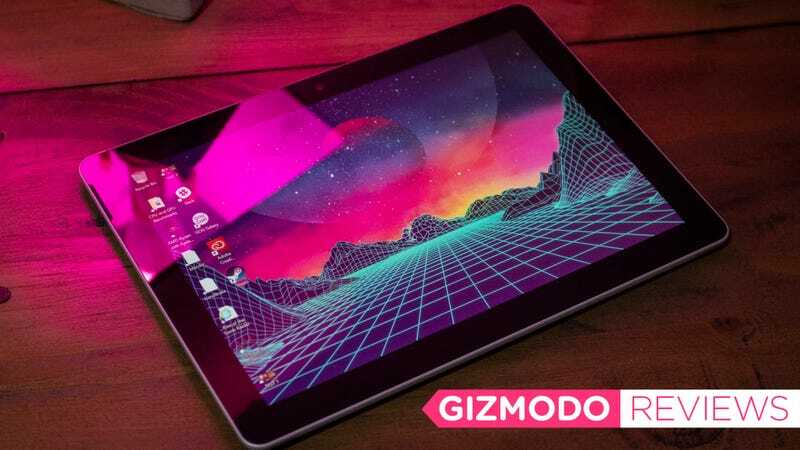 It's tiny, gorgeous, and more productive than an iPad or other cheap PC. The CPU is still pretty underwhelming. The Surface Go is a 2-in-1 laptop. But it’s a very, very good one that jumps up to being exceptional when you consider its price versus other devices of the same ilk. It ships as a tablet, but for an additional $100-$130, you get a keyboard cover that is damn sturdy and not at all cramped for a keyboard accompanying a 10-inch device. Thanks to its small size it’s even better to use in the lap than the Surface Pro. The machine currently comes in two flavors: a $400 version with 64GB of storage and 4GB of RAM, and the $550 version with 128GB of storage and 8GB of RAM. I reviewed the latter. This 10-inch cousin to the much faster and larger Surface Pro will call to mind an iPad the first time you pick it up. They’re both tablets first, with a minimal number of inputs (the Surface Go has one USB-C port, one 3.5mm audio port, and a Surface charging port), and they both have detachable keyboard covers. The Surface Go is about the same size as a $650 iPad Pro, too—though it does weigh a fraction of a pound more. While other laptop and phone makers have gone to extreme lengths to shrink the bezel, the Surface Go has a big fat one that feels quaint. But as with the iPad, it makes sense for when you’re using it in tablet mode. My fingers never accidentally brush the screen when I’m flipping through a comic or browsing a website, and I like that I can hold it in one hand without worrying about accidentally firing off an email with my thumb. The backlit keyboard cover feels great to type on. Because of its small size, I’ve found myself using it in lieu of my iPad. I browse my emails and message friends while watching TV. I carry it upstairs as I prepared breakfast, so I can keep my eye on Slack, just in case my boss pings me. About the only thing the Surface Go doesn’t naturally do as well as my iPad is play quick games or load up pretty mobile apps. The Windows Store is nowhere near as polished as the Apple Store, and navigating GOG and Steam in search of a game that wouldn’t bring the Surface Go to a crawl was a tedious challenge I made little time for. Because let’s be clear, you ain’t playing traditional PC games on the Surface Go. Microsoft claims it worked hard with Intel to optimize the performance of its Pentium 4415Y CPU, and I’ll admit that in simple activities like browsing and checking my email, the Surface Go feels as quick as a much more powerful device. But opening Photoshop quickly makes it apparent that the Surface Go has a very budget CPU baked into its tiny chassis. As does the result of our Photoshop test, where we resize and convert a series of RAW images to JPEG. The Surface Go took 2 minutes and 27 seconds to accomplish the task. That’s more than a minute longer than any other laptop we’ve tested to date. It also performed miserably in the one game benchmark we were able to run. When attempting to play Civilizations VI at its High graphics settings, the Surface Go took an average 304ms to render each frame. That’s the slowest result we’ve recorded—though it should be noted that the Asus Nova Go, a Windows PC with a Qualcomm CPU usually found in laptops, was so slow the benchmark couldn’t even be attempted. The Surface Go scored terribly when we ran Geekbench 4, too—though it still beat out the pricier Asus Nova Go. The Surface Go has a multicore score of 3924 and a single core score of 2028. By comparison, the Asus Nova Go managed 3075 for the multicore and 794 for the single. To understand just how low both those score are—the average multicore for laptops we’ve tested is 11025, and the average single core is 4095. What all those numbers mean is that this thing won’t be processing any big files or crunching large numbers anytime soon. Big PDFs and RAW images take a while to load. Sometimes the browser will get sluggish and toddle along from tab to tab. But it’s a $500 2-in-1 laptop. Some kind of tradeoff had to occur. The bezel is just a hair skinnier than the iPad Pro’s bezel. Beyond its underwhelming performance, the Surface Go is a winner. Battery life is similar to Microsoft’s claimed 9 hours (we got 8 hours and 5 minutes). The 3:2 10-inch display has a sharp 1800 x 1200 resolution that handles movies as beautifully as the pricier iPad Pro. Even the keyboard-and-trackpad combo is essentially a smaller version of the one that comes with the latest Surface Pro, and it’s pretty lovely to use. And here I find myself jumping back to comparisons with the iPad Pro. As with the Pro, the keyboard cover is optional and pricey—but Microsoft’s keyboard cover is better than Apple’s in every way. First, there’s the fact that it has a trackpad—the iPad does not. Also, the keys are backlit, and they’re snappy, too. Yet the real coup de grace over the iPad, and indeed over any other 2-in-1 or tablet at this price range, is the hinge on the back of the Surface Go. It’s the same hinge found in the Surface Pro and, as silly as it sounds, it’s a very good reason to buy the Surface Go. With my iPad, I have to precariously fold the cover if I want to give it tilt while reading on my bed. When I try to type with it in my lap, it inevitably collapses like a house of cards. The Surface Go, by comparison, feels almost as stable as an actual laptop. I never worry about it when I’m whipping up a blog, and I genuinely appreciate how many angles I can set it at when I’m watching a movie or reading a book. I don’t think I can say enough nice things about the hinge. Often times when you’re buying a product at this price range, it feels like something within the body of the device has been sacrificed. I’m not talking about the guts—the Surface Go’s guts are fairly typical for the sub-$550 range of devices. I’m talking about the design of the device. Until the Surface Go, the only cheap laptop with any pizzazz was the HP Stream and Samsung’s Chromebook Plus. Yet those devices still feel like they came off a shelf during Black Friday at Walmart. They’re cheap, and it’s apparent in the materials they’re made of. The Surface Go feels like a smaller version of the premium Surface Pro. It’s a damn nice looking device—the kind people will note with admiration when you’re at a coffee shop or sitting in a crowded meeting. It’s proof that cheap laptops don’t have to feel or look cheap, and I can only hope that it inspires other computer makers to start seriously considering the build quality of their budget devices. If you have the money and you want a solid Windows machine that’s primarily for browsing, emailing, and word processing, the Microsoft Surface Go is it—the device you need to buy. Looking for a second computer? It’s a no-brainer, splurge on this one. 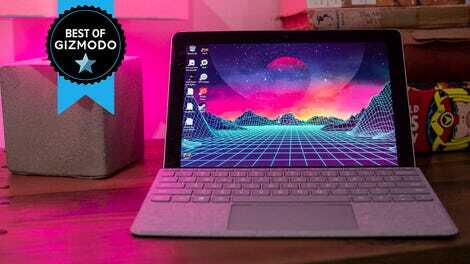 There might be faster budget laptops, and there might be cheaper ones, but the Surface Go feels like a perfect representation of what laptops at this price should be. It starts at just $400! The battery life is acceptable. It’s not powerful at all.